Radiologists have interpreted exams for my children four times in the previous six years. Only one of the treating physicians actually told me there was a radiologist involved in my child’s care—at least until I asked about the radiologist’s report. Two different physicians at a prominent pediatric sports medicine facility explained my kids’ fractures while showing me the images on a PACS monitor in the exam room. Another orthopedist showed me the routine, nondisplaced fracture on a light box in his office. When I asked about the radiology report, he told me that he usually doesn’t read them. The one time the radiologist was mentioned without my prompting was when the pediatrician explained that an ominous-sounding echocardiogram report was nothing to be concerned about after consultation with a pediatric cardiologist. I understand how radiologists contribute to diagnoses much more complex and subtle than my children’s various soccer injuries. But that understanding comes from my job, not clinicians trumpeting radiologists’ important role in the health care process. While providing quality exams, reads, and reports for referring physicians remains the focus of medical imaging, health care reform raises a growing debate about the value and role of patient satisfaction. In the fee-for-service (FFS) independent practice model of delivering diagnostic radiology services, quality service usually meant focusing on the needs of the referring physicians and the hospital. Patients were well served primarily by radiologists providing quality exams and reports to their physicians. But an array of forces is changing—some of them may just be threatening to change—radiology care. Utilization review and the economy have slowed imaging volume growth. The expansion of highly integrated care, which was starting to happen in the marketplace before the Affordable Care Act’s boost to accountable care organizations, adds momentum to non-FFS reimbursement. Integrated care also is part of the thrust behind hospitals and health systems acquiring practices to solidify their networks. Increased efficiency from using digital workflow has effectively increased the supply of radiologists. Remote reading also allows that increased supply to compete for work nationally, not just locally, again increasing competition. 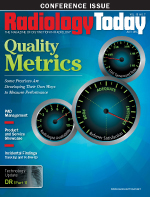 Despite its still nebulous definition, patient satisfaction will assume a larger role in convincing hospitals and health care systems that your radiology group is the one they should work with. That’s just a business truth, even though it may never correlate with clinical outcomes. How to nurture and measure patient satisfaction is a common theme at the meetings I attend. There’s no off-the-shelf answer, but savvy practices are pursuing individual ones because they know they will be asked.